Erasmus+ is the programme of the European Union in the field of education, training, youth, and sport. It is implemented for the period 2014-2020. The programme is open to 33 countries in total, 28 European Union Member States and 5 other countries. As a programme country, Turkey can fully take part in all actions of the Programme. Erasmus+ is composed of three Key Actions and Sports and Jean Monnet Activities. Key Action 2 supports partnerships projects. 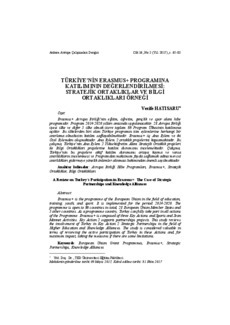 This study reviews the involvement of Turkey in Key Action 2 Strategic Partnerships in the field of Higher Education and Knowledge Alliances. The study is considered valuable in terms of reviewing the active participation of Turkey in these Actions and, for maximum impact, taking the measures if there are some limitations.